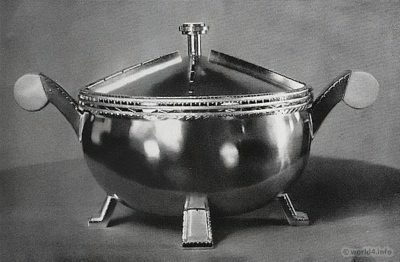 Home » 20s » Tureen hammered. Silver, Ivory. Design Paula Strauss. Tureen design by Paula Strauss. Tureen hammered. Silver, Ivory. Design Paula Strauss. Silver works of P. Bruckmann and sons A.-G., Heilbronn. Published in: The Form. Magazine for creative work in 1929. The goldsmith Paula Straus (1894–1943), a member of the Deutscher Werkbund, is one of the most important representatives of German gold and silversmithing. She was one of the first blacksmith, whose works have been produced in series. Previous PostBauhaus Vase design by Paula Straus. Next PostBauhaus Desk fitting by Wilhelm Wagenfeld.